The editorial series Freshwater Fauna of Poland has existed since 1935. Up to now 22 volumes (in Polish) have been published, treating both vertebrate and invertebrate animals. Particular volumes contain rich general data concerning described taxa and detailed information on species, genera, families and orders. Integral parts of all volumes are identification keys. Thanks to such a way of presentation, monographs of particular faunistic groups are true compendia of the up-to-date state of theoretical and practical knowledge of these animals. 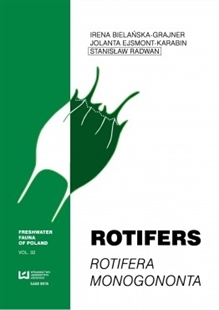 The volumes of the series are authored by eminent specialists of the Polish fauna. The present volume, by Professor Irena Bielańska­Grajner (University of Silesia, Katowice), Professor Jolanta Ejsmont-Karabin (University of Białystok and Hydrobiological Station of Polish Academy of Sciences, Mikołajki) and late Professor Stanisław Radwan (University of Life Sciences, Lublin), concerns rotifers (Rotifera) from the order Monogononta. The general part includes such topics as the origin of rotifers, taxonomy and systematics, morphology, anatomy, biology, ecology, zoogeography, and methods of sample collection, preservation, storage, and processing. The systematic part comprises the keys to orders, families and genera, and survey of species, based on illustrations including many original micrographs in colour. In total, over 460 rotifer species found in Poland are presented and characterized, as well as over 140 species which have not yet been recorded from Poland but are known to occur in the neighbouring countries, so may be encountered in Poland in future. This book will be useful not only for those who specialise in rotifer research, but also for other such as zoologists and hydrobiologists, biology students, university teachers and specialists of water quality management and protection practice.